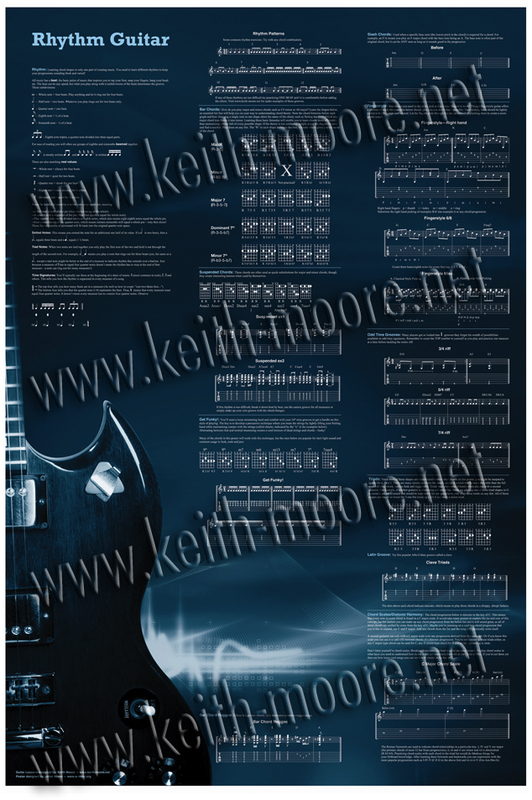 Developed through Keith’s twenty years of teaching guitar, this glossy 24×36 poster captures at least six months of private lessons. The cool, high-tech design includes crystal clear charts and tablature examples, making this poster informative as well as a hip, artistic decoration to any wall. A FREE audio folder with each example played is available to owners, so there is no guessing how each progression is supposed to sound. This poster is more than a collection of meaningless chord charts; You’ll learn HOW to apply this information into your own playing. Lessons taught in this poster include: Rhythm notation, bar chords, triads, rock, funk, Latin, and reggae grooves, fingerpicking, odd time riffs, chord scales and more! You would need to spend at least $100 in guitar books to get the same range of information on this poster. Quick, easy lessons in your room or studio, put this poster on your wall and take your playing to the next level! NOTE: Website logos on this image are a watermark that isn’t on the actual poster. This poster is currently being sold through my Etsy shop.